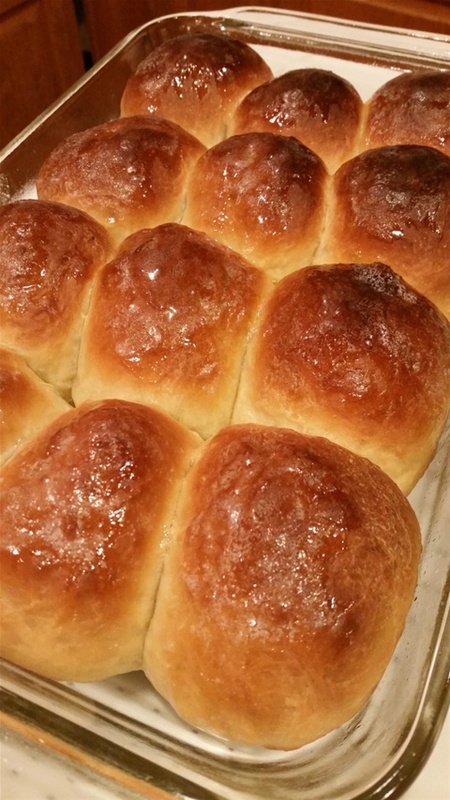 Golly these rolls are sweet, soft and tasty! Here it is - the famous sweet bread from my Passionate Person Emily's childhood! This is a crusty, dense sweet bread that is a copycat recipe for King's Hawaiian Bread. I didn't want to buy a bunch of cans of pineapple and had trouble finding pineapple juice, so I used mango juice and it was delicious! I have a rule when it comes to baking bread. I only eat it when it is hot out of the oven. Really. After that I try to give it away and don't eat any more of it. Needless to say, after I made these rolls I scarfed down as many as possible before they technically cooled. Beat eggs and add juice, sugar, ginger, vanilla and butter together in mixing bowl. Measure 3 cups of flour into separate, large mixing bowl. Stir egg mixture into flour until well-combined. Add yeast and mix. Add 3 cups flour and mix. Dough will be thick, so use your hands to mix until thoroughly combined. Cover bowl with cloth and place in a warm area for 1 hour to rise. Flour a large, flat surface for kneading. Remove dough from bowl and knead in 1/2 cup flour. Knead just a few times to incorporate the flour and then split dough into two parts. Make into rolls if desired and place them onto greased pans. Cover and set in warm place to rise for another hour. Bake at 350 degrees F for 25-30 minutes or golden brown.